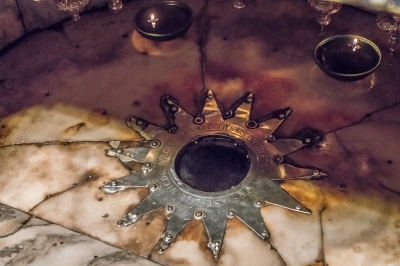 “Birthplace of Jesus: the Church of the Nativity and the Pilgrimage route, Bethlehem” is a major Christian pilgrimage destination and the center of the Christmas celebration. 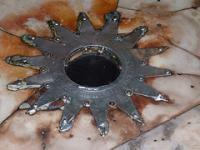 It holds the Church of the Nativity, which was built over cave that is considered to have been the birthplace of Jesus. Extensive restoration has begun since 2013. This isn't an ideal time to visit; almost every inch of the interior except for the altar and the Grotto of the Nativity is covered by scaffolding. Since the church was in such a compromised state, I had two choices: I could leave immediately or I could go against my better judgement and queue up for the Grotto. At the end there was really one choice, so I hesitantly threw myself into the crowd, a mix of pilgrims from all over the world. When I could finally see the entrance to the Grotto, some 80 minutes of being smouldered in a sweaty chamber later, I improbably lost my will to continue and left. Forget for a moment the church's obvious significance as Jesus' birthplace, this Christian structure has, due to both luck and the perseverance of many dedicated parties, remarkably remained standing almost 1,500 years later in this often tumultuous region. History has a price -- the wear and tear has turned the Church of Nativity into what might very well be the ugliest major church I have been to, but this intangibility is also the crown jewel that puts this place on the map. Millions before me have made this pilgrimage to this humble outpost and millions will continue to do so after me. Read more from DL here. Traveling to Bethlehem from Jerusalem is not difficult if you are not an Israeli. There are some restrictions when going into the Palestinian Territories, and your van might get searched crossing the border, but dozens of buses and tour groups do this every day and it is quite normal. There are currently no safety issues going to Bethlehem. Most groups visit the Church of the Nativity and leave. There is more to see in the area including the Milk Grotto and Star Street. The church is very old. The current building was built in 565 by the Byzantine Emperor Justinian. Over the centuries there have been many restorations and repairs to the building, including a recent restoration which took place in 2017. The birthplace is in a very small alcove under the main altar area. There is usually a long line to visit the spot which is marked by a silver star, which is shown in the photo above. The door into the church is also ridiculously small, so you will have to crouch to enter the church. This was created several hundred years ago to prevent horses from entering the church. Although in December 2015 political situation in Palestine is not very stable and media report about safety threats, I decided to visit Bethlehem with my family (including two babies). From Damascus Gate in Jerusalem we took bus 231 directly to Bethlehem (8 NIS per adult) and after about an hour, without security controls, we reached this place. The Church of the Nativity is not very far (definitely in a walking distance) from the bus stop, but we also wanted to visit some other places in Palestine, so we took a taxi. Although in ‘normal’ times the Church is crowded with tourists, two weeks before Christmas 2015 it was nearly empty. We did not need to stand in a queue and went directly to the basilica. Unfortunately, interior of the basilica is under overall renovation and all area is covered by scaffolding. Works are even in the Grotto, which however kept its unique character. Near the basilica I recommend visiting St. Catherine church and its courtyard. We returned to Jerusalem on the same bus 231, this time with detailed control of Palestinian citizens (we, as foreigners, did not even show our passports). Overall, I liked Palestine very much, we did not feel unsecure in any moment and everybody was friendly (our taxi driver was really happy that foreigners visit Palestine and each time he mentioned foreign tourists he named them courteously ‘dear visitors’). Very interesting to visit is the Church of the Nativity. However, the highligh of this WHS is that so many different or closely related faiths interact with one another in the main square and use the same place to worship the same God! Apart from the WHS though, the situation in the region is very sad and I won't be visiting Israel or Palestine again before the Disgraceful Walls are demolished. 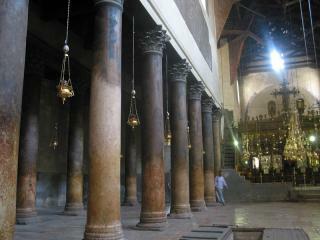 I visited in Bethlehem in January 2011 and of course the main site there is the Church of the Nativity. When I entered the church (through very small door) there was service still going and the priests (or monks) were singing and incense was smelling strongly. Because the priests were inside of the Grotto of the Nativity their singing was echoing mysteriously around the church. Very mystic atmosphere. After the priests left somewhere through a secret door I went to see the grotto myself. Smell of incense was very strong and I had hard time breathing. I watched some time how people kissed the spot where Jesus was born and then walked around the church complex. When big Russian tourist group arrived I decided to leave the church. As this is the most holiest place in Christianity I think it deserved the World Heritage Site status. The Church of the Nativity itself isn't really spectacular looking and also inside it's quite simple but the history is the thing that matters here. Ibn Battuta: "On my way there [Jerusalem] I visited Bait Lahm, the birthplace of Jesus -- on him be peace -- where the trace of the palm trunk is still to be seen surmounted by a vast edifice." Disputed territories: The pilgrimage route passes through East Jerusalem.